A compassionate contractor went beyond providing professional services when they made a £6,400 donation to Princess Alice Hospice. 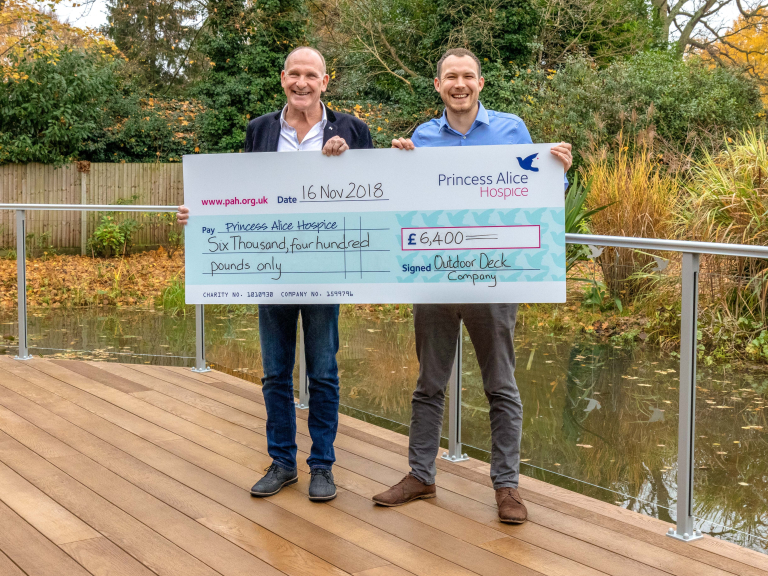 Mike Wilderink, Managing Director of the Outdoor Deck Company of Teddington, presented the cheque on the fantastic new decking area installed by his company at the Esher-based Hospice this summer. The Outdoor Deck Company were commissioned to remove the existing deck that surrounds the Hospice and replace it with a new composite decked area with glass balustrades. The new deck provides an attractive and tranquil safe outdoor space for a number of patient rooms, providing beautiful views of the gardens and koi pond. Martin Osborn, Hospice Facilities Manager, who accepted the donation, said: “We are delighted with the new deck, which provides our patients and visitors in the front and west-facing rooms with a relaxing and peaceful outdoor space. Princess Alice Hospice has, for more than 30 years, provided free, high quality, specialist end of life care to tens of thousands of people across a large part of Surrey, south west London and Middlesex. Today, at any one time, Hospice nurses, doctors and other specialist staff are looking after more than 800 people in need. The Hospice has a mission: to reach out to even more people by delivering outstanding care to those that need it. To enable us to do this we will rely on the commitment and support of our communities who help us raise vital funds. £9.9m is needed each year to provide vital and much needed services. With limited NHS fundraising, 74% of our income is generated by fundraising, retail operations, donations and legacies and it’s only the ongoing, generous support of our community and beyond that makes it possible to do our work.